New data plan got you down? It's closing time at the all-you-can-eat mobile data buffet. More operators globally are moving away from unlimited data plans and moving towards tiered pricing with hard ceilings on the data available for you to use. These data caps leave consumers to wonder just how many times they can browse their favorite sites, read their email, or watch videos before getting hit with an overage charge for exceeding their plan's limits. In this month's State of the Mobile Web Report (English only), Opera details how to manage that shiny, new plan, so you can get the most out of your shiny, new device. Loading facebook.com just once will eat up more than 200 KB of data, according to Opera's research. With a browser like Opera Mini, which shrinks data down to a fraction of its original size, you can view Facebook 8.5 times using that same 200 KB. By saving data here, you can "spend" it on more useful activities, such as editing documents for work, or watching videos of sneezing pandas. "I hate billing surprises and I don't want to obsess over each page load. I just want to check my email, browse the web and use apps," said Lars Boilesen, CEO, Opera Software. "I think most people feel the same. That's why we recommend some common-sense strategies to get the most out of these new plans. A few simple tips can go a long way." -Open the full email only if necessary. Open email attachments sparingly, if at all. -Manage your apps' hunger for mobile data. Disable push notifications. 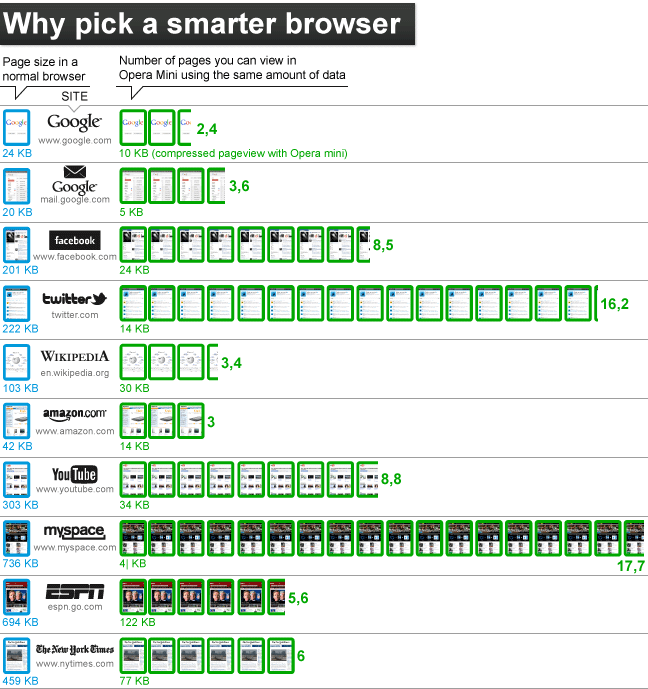 -Consider using a smart mini browser, like Opera Mini. These keep you from downloading too much data to your phone. -Spotify is awesome, but use your locally-stored playlist when on the go. -Update and download apps over WiFi. -Consider using mobile-friendly webpages. Our research shows they shave off a significant amount of data that otherwise would count against your cap. -Turn off images when nearing your cap. Most browsers make it easy. In Opera Mini, just click Settings > Load Images. -Avoid HD video on YouTube when browsing on a mobile connection. Just 10 minutes of HD video per day fills a standard 2GB plan. The worldwide World Wide Web. Any device, any platform, any bandwidth, absolutely anywhere in the world - Opera Software was founded in 1994, based on the idea that access to the Web should be a universal right. Opera Software ASA is listed on the Oslo Stock Exchange under the ticker symbol OPERA. 200 million people (and counting) are using the Opera, Opera Mobile and Opera Mini browsers. Participation changes everything. Learn more about Opera at https://www.opera.com.